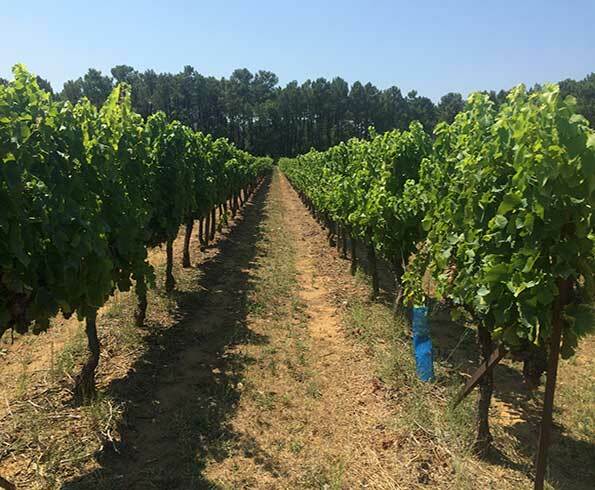 The Vaucluse is a fan-shaped region of Provence with Avignon at the handle, low-lying plains in the centre (Carpentras, Mazan) and Mont Ventoux and the Vaucluse mountains at the east end. The whole area is a paradise for cyclists, with abundant minor roads, gorgeous villages every few km in each direction, excellent campsites, courteous drivers, and off-road trails everywhere. Vaucluse's two great Roman-era towns sit on the Rhone barely 25km apart. They're an easy ride apart via the trails on the west side of the river. Coming from Orange, take the D976 south out of town to the highway bridge, cross it and don't be tempted by the inviting-looking trail down the east side of the river - it runs into dense bush behind which is fenced private land. Instead hit the trail down the west bank for several kilometres until you see the flood gates at the north end of Île des Papes. Cycle across the top of them onto the island, then across the second bridge onto the larger Île de Barthelasse. You can then follow the quiet D228 road along the shore of the island, past the campsite and into Avignon via the highway bridge which has cycle lanes in both directions. You can return to Orange via the same route, but I wanted to visit Châteauneuf-du-Pape well to the east of the river. The main D225 road out of Avignon has a nightmare section on the D225 along the east bank getting out of town. Turn this if you can by taking Route de Lyon out of town, Charles de Gaulle, then following back roads to Sorgue. From there take the D17 north west to Châteauneuf-du-Pape. In the first guidebook I read on Vaucluse before going there, Châteauneuf-du-Pape was described as the most intoxicating village in all of France. A bold claim, but it begged a visit. After an hour there, I was convinced. It probably is. Les dentelles make a great day ride from any of several villages in the surrounding area. I did it from Carpentras which makes a terrific loop through Carombe, Le Barroux, Suzette, Lafare, Beaumes-des-Venise and Aubignan. The climb up from Carombe to Suzette, particularly the last section, is steep and sheltered from the wind so it feels like riding through a cauldron. A worthwhile detour on the way up this long, slow climb is a visit to Lac du Paty which can be reached through the Ravin du Lauron, a recreation area with an entrance to the right just after the campsite (Le Bouquier) north of Carombe. Suzette is beautiful and has a charming hilltop cafe, Les Coquelicots, which is open all day. It's pretty much all downhill from there all the way to the stunning village of Beaumes-des-Venise which has great cafes and restaurants and is worth exploring before taking to the crazy descent on the road to Aubignan. 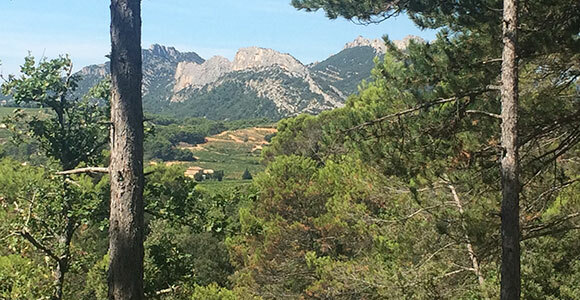 All the way along this last half of the ride, you are traveling right under the Dentelles and have beautiful, changing views of them all the way. You can ride through the Dentelles if you have fat (-ish) tires, or don't mind a few bumps. The best route for bikes is the gravel road from Montmirail to Gigondas. Ride it fromVacqueyras and you can do a loop, returning via the D7. 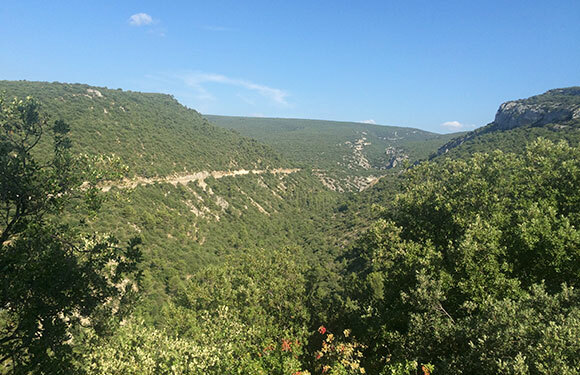 Several roads go north-south over the Vaucluse mountains from the Luberon to northern Vaucluse. Many of these roads are tiny, narrow (but usually sealed) empty backroads ripe for exploring, and they run through some of the nicest hill country in France. Dodo discovered a few of them, starting with a memorable trip to Murs. As far as I can tell, the name of this place means just what it sounds like in French - walls. 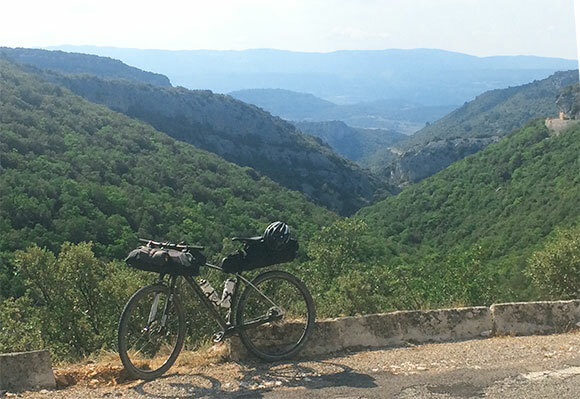 If you're touring by bike it's well worth a visit, as it's a beautiful hill top village in an area with an incredible - incredible - focus on food, magnificent views over the northern part of the Luberon, and just a sense of the joie de vivre that bubbles through this part of France, but somehow on steroids. Murs has no cafe as such but it does have a restau gastronomique if you're so inclined. The village also marks the start (going south) of the region of France where they have taken the concept of the epicerie - a sort of amped-up small deli with a small range of absurdly good local produce, all restaurant quality - to a new level altogether. In the southern Vaucluse and Luberon, if you're a foodie, it's heaven. Someone drives up here from Roussillon once a day with little goats cheeses. Stuff like that. This epicerie is closed in the afternoons (like most things in Provence) but re-opens around 330 and closes - note this time - at 630. There are no other shops in Murs. Dodo rode from Villes-sur-Auzon by a series of back roads roughly communicated to him, via a stream of anecdotes with occasional embedded directional information and much waving of arms not in the indicated direction of travel, by a new friend made in the campsite Les Verguettes. Thoroughly lost among the vines of at least four separate properties, accumulating the limestone dust and sweat that become the badges of honour in this part of the world, still tasting the coffee from Villes-sur-Auzon and still carrying the croissant avec jambon et fromage foisted on him at the cafe, Dodo enjoyed one of the great mornings of his life on this route. The chance to visit, en route, Venasque should not be missed. The place is beautiful. Dodo enjoyed it too much, and the resulting climb to Murs was hell afterward. Over the Col des Lignes (misplaced on Google Maps), looking roughly southeast toward Murs. Very glad to reach this col. Wine for lunch is generally great though. Murs is a fantastic windswept, walled hilltop town on the Vaucluse mountain plateau. The campsite - thoroughly recommended - is at Les Plaines, south of town, 2-3 kilometres. 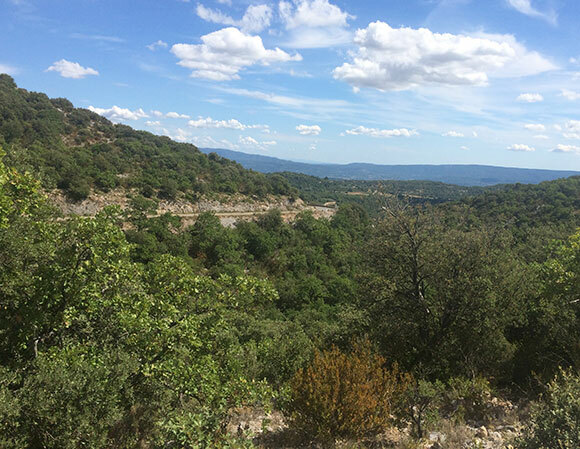 In a wood overlooking the Calavon valley of Luberon, it's a wild, almost spiritual place to spend the night. The facilities are basic and there is no shop. At night it was windy and cold and the morning was brisk. Dodo left reluctantly and one day will return to just sit here, for some days. The road down to the campsite turns into gravel as you get there - you can follow this to the Luberon below, at one hell of a clip on a loaded bike, but beware of 4WD traffic coming up, and some hideously off-camber corners. Dodo took the D4 to Roussillon, and still got up to 60km/h. Having survived this descent, and with other hills to visit besides this one, I rode the rest of the trip more carefully. Another stunning hill crossing, Dodo took this one south-north from Saint-Saturnin-lès-Apt, a lovely place altogether and worthy of a visit all on its own, to Sault. Being fully loaded I was in no hurry and thoroughly amenable to stopping to take photos. The D943 heads west of SSlA, climbing gently while sidehilling the main Vaucluse plateau. After a few km it swings north and climbs up the east side of the Combe de Font Jouvale, yet another stunning river gorge. This road climbs relentlessly to a bridge just short of Font Jouvale which offer amazing views back down the gorge to the Luberon. From Font Jouvale the road swings east and then north where it follows the west side of the Combe de la Sigalière before emerging up onto the lavender fields south of Sault. Here, finally, the climb is over and you can enjoy the ride over to Sault with beautiful views to your left over to the upper Nesque, Monieux and behind them, Mont Ventoux. Route from Saint-Saturnin-lès-Apt to Font Jouvale on the D943. Looking back down the route where it climbs the Combe de Font Jouvale. Instead of sidehilling west out of SSlA on the D943, you can go right over the top of the plateau on the little-used D230. Turn right off the D943 immediately after leaving the town, onto the chemin des moulins. Then turn right onto the D230. It is 15km from here to Saint Jean where you rejoin the route above, 9km to the highest part of the ride, at 1000m. There's no one particular thing on this route, no one feature, no sudden view after turning a corner, that made this one of the most enjoyable rides I've ever done; it's just perfect riding, the whole way. Combe de la Sigalière, looking south to the Luberon range.